The Indian decorative embroidery art of Mirror Work (shisha) is thought to have been developed by the wife of Shah Jahan who built the Taj Mahal in her honour. Since the time of the Moghuls the women of Gujarat have continued to use mirrors in their embroideries. 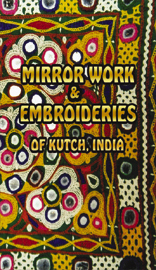 This film shows in detail how the mirrors are produced in small furnaces and features dowry embroidery of blouses and dress fronts, shawls, bedding covers, jewellery bags, and quilts - all incorporating the mirrors. These are worn and used by Ahir, Rabari, Harijans, Paks, Jats, Sodhas and Rajputs: nomadic, herding Muslim and Hindu communities. Filmed in the Rann of Kutch contents include: blowing the shisha glass, mirror work, chain stitch, filling stitches, cross stitch, appliqué, interlacing and soof embroidery.